Hey! You look like a fine wrangler and we could really use your help! Oh…? What’s that? You want specifics? Well, we’re looking for a rancher to come to Far, Far Range and deal with some…well, I don’t want to ruin the surprise! Most importantly, are you up to the task? 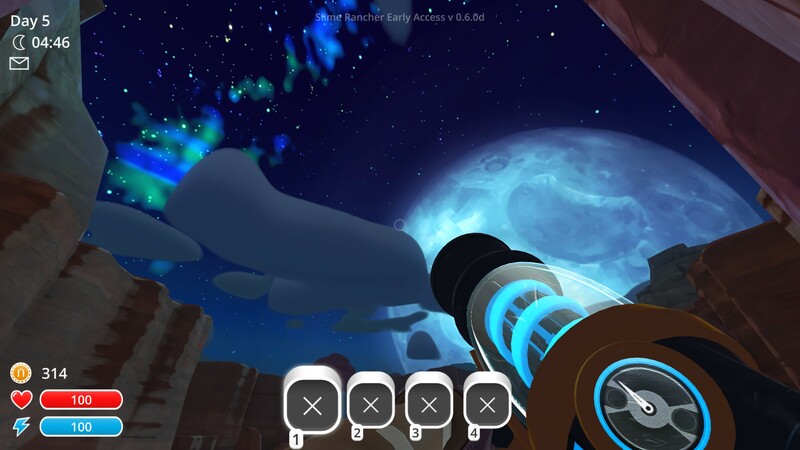 Welcome to the wonderful world of Slime Rancher. Travel to a world that exists thousands of light-years away from Earth. Here, you play as Beatrix LeBeau as she gets accustomed to living her new life in Far, Far Range. 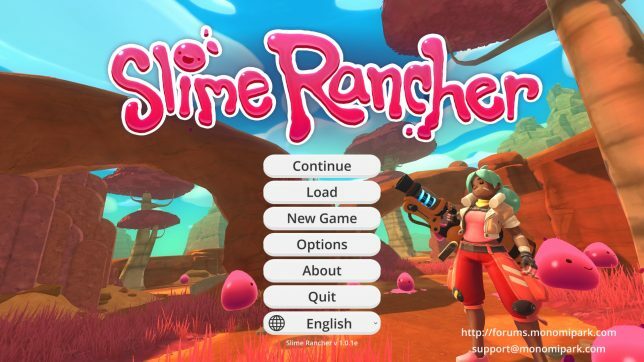 As you might have guessed based on the game’s title, you’re a rancher of slimes! As you progress through the game, you will receive what is called Star Mail which helps you get to know some of the people in the game and even a little about Beatrix’s past. In this charming world, slimes are ever abundant. To make things even better, slimes are diverse and there are many different types of slimes. Think things couldn’t get better? You can combine two slimes together which can make them look even cuter. But things couldn’t be better right? Well, they’re about to. 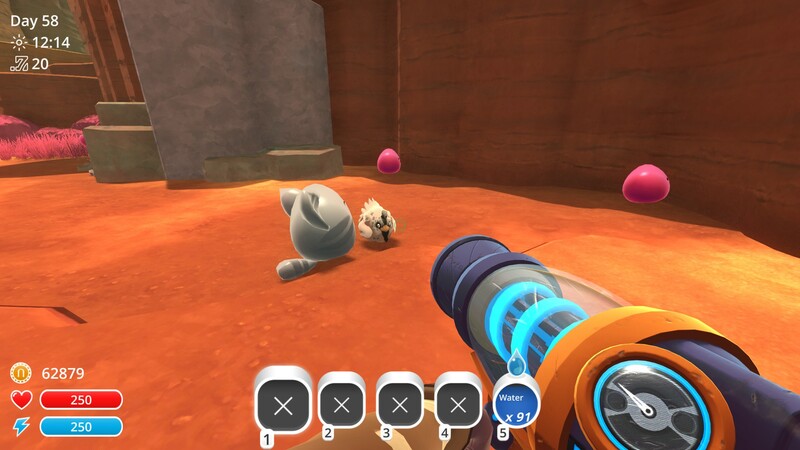 In Slime Rancher you can get Tabby slimes, cat-like slimes which meow and will hold on to food (they’re very adorable and one of my favorite slimes in the game). A Tabby slime getting ready to show down on its favorite meal: Hen Hen! As a rancher, one of the most important things is to be able to maintain your ranch. To do this, you need to collect and house slimes. There are many plots in which you can build on to improve your ranch. Among the things you can build there are corrals which house your slimes, gardens which let you grow food, storage units, or pens in which to house chickens. Each unit can be upgraded as well. Some slimes have their own conditions. For example, Phosphor slimes can’t be in sunlight and Puddle slimes have to be housed in water and there can only be four slimes per pond. Also, slimes have their own dietary needs. In example, some slimes will only eat meat whereas other will only eat fruit. Once fed, a slime will drop a plort of their slime type which you can sell on the market to make money. However, if you sell too much of one plort, the market will become oversaturated and the value of that plort will drop. Fire slimes in the incinerator and Puddle slimes in the pond with a carrot garden close by. As mentioned above, you can combine two types of slimes (with a couple of exceptions) to form what are called largos. There are a few reasons as to why this is beneficial. One reason is because it allows you to optimize space instead of having a corral for every slime. Also, when you combine two slimes, their dietary preferences are now fused. So instead of only eating fruit, now the slime will eat both fruits and veggies. After feeding them, you’ll get both of the plorts from the slimes which will allow you to make more money while using less resources. I will say there’s not too much to the story of this game. Slime Rancher is more based on exploring and discovering the different types of slimes and exploring Slime Science. 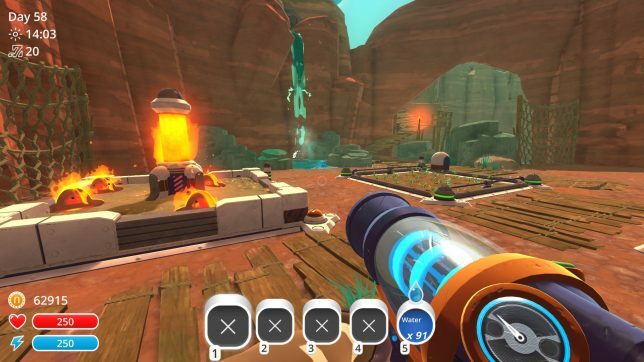 This allows you to construct items using plorts that will either help you gather more materials or help you with various things like slime control and travel. I love the art of this game. I think it looks gorgeous and very cute. I loved the game back when it was in Early Access and it’s been a pleasure watching it grow. It’s an easy world to get sucked into. Day 1 of me playing Slime Rancher Day 1, I was looking around aimlessly trying to figure out what to do because I was honestly confused. As I was wandering around, I stumbled upon many Pink slime. At this point, I was so excited that I captured as many Pink slimes as I possibly could, thinking they wouldn’t spawn back (spoiler alert—they do). There were a lot of plorts lying around so I sold them to buy a corral. I made the corral and then put more than 40 Pink slimes in it; the corral was overflowing. Then day two rolls around. I walk out of my ranch and see all the Pink slimes. I got annoyed with how many Pink slimes I owned and proceeded to get rid of almost half of them. The beautiful night sky in the Far, Far Range. If you’re a lover of games that allow you to get lost in exploration or just like cute slimes, then this game is definitely for you! See you on the Far, Far Range, fellow rancher. Colee is part environmental scientist part gamer part musician part writer who is sassier than a sassafras and feistier than a snapdragon and has too many husbandos.